A crack was found on the axle of a CRH380BL train, the type used on the Shanghai-Beijing high-speed line, just over two weeks after the service went into operation, it has been revealed. According to a flaw detection report obtained by the Caixin Century magazine, workers found the crack on a train axle on July 15 at a base in central China's Jinan City. CRH380BL trains on the Shanghai-Beijing route, about a quarter of the trains used on the line, were recently recalled. Changchun Railway Vehicles Co, a subsidiary of China's key train maker CNR, said 54 CRH380BL trains would be thoroughly checked to see whether they need to be overhauled. CNR blamed frequent breakdowns of the CRH380BL on train sensors but did not mention any problems with axles. The crack was about 7.1 millimeters long and 2.4mm wide, according to the detection report, and it was suggested the axle be replaced. 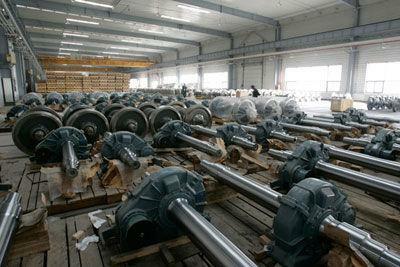 Axle flaws were also found on other trains of same model, according to Caixin. Questions over China's rapidly expanding rail system reached a peak after a fatal train collision that killed 40 on July 23 in Wenzhou. Shanghai railway officials said they would continue to cancel bullet train services and reduce ticket prices due to the lower speeds ordered by the ministry after the crash. A first-class ticket from Shanghai to Hangzhou would now be 124 yuan, down from 131 yuan, while second-class tickets will be cut from 82 to 78 yuan, after services are cut to 83 pairs of trains a day, down from 90 pairs, from August 28, Shanghai Railway Bureau officials said. The Shanghai-Beijing route will see further cuts from August 28 when there will be 50 pairs of trains along the route daily, down from 52, but four pairs of sleeper trains will be introduced. So far, ticket prices are unchanged. Services on the Shanghai-Nanjing route are unaffected.